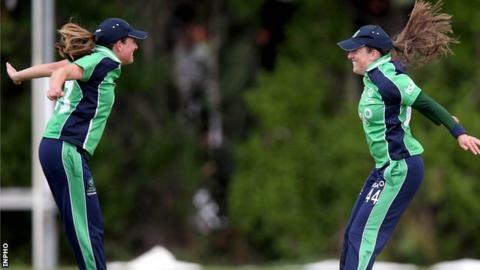 Ireland eased to seven-wicket win over Zimbabwe to top their Women's World Twenty20 qualifying group and set up a semi-final against Scotland. The Joyce twins starred as the Irish made it three wins out of three in Bangkok on Tuesday. Isobel bagged four wickets as Zimbabwe were dismissed for a paltry 78 before Ciecilia top-scored with 36 to help Ireland to 79-3 in 15.2 overs. Victory over Scotland will secure a place in next year's World Twenty20. The top two teams from the qualifying tournament will take on the game's elite in India. Ireland have avoided a meeting with tournament favourites Bangladesh but face a tough encounter against the Scots on Thursday. Zimbabwe also came into Tuesday's game at Terdthai Cricket Ground with a 100% record in Group B but they were outclassed by the Irish. Isobel Joyce took 4-20 and Robyn Lewis 2-9 as Zimbabwe were skittled out in 19 overs. The target was easily achieved after Clare Shillington (22) and Cecilia Joyce put on an opening partnership of 48.